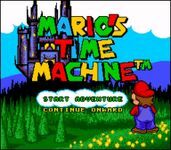 In this game, Mario has to travel back in time to restore artifacts which were stolen from their original times, and, in the NES version, save Yoshi from Bowser. Set in 1993, Bowser is in possession of a time machine. He went back in time to steal many artifacts from the past, and placed them in what he considers "...the greatest museum of all time". If the items are not returned soon, history will be changed permanently.